Leonard Portfleet, known as Len was born in Sudbury in 1910. 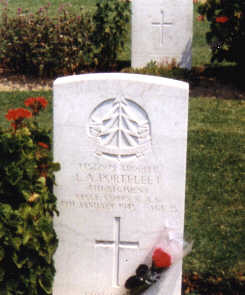 He was the son of Ethel Portfleet (later Ethel Johnson). 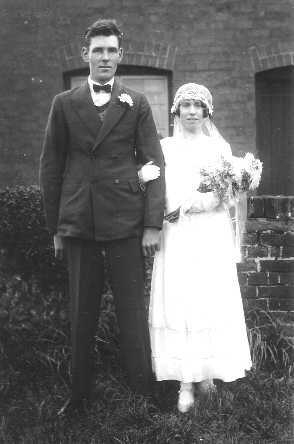 Len married Dorothy May Woodgate of Cornard Tye; his daughter recalls that he was 6 feet tall and her mother only 5 feet in height. Their daughter was born in Sudbury before they moved first to Canhams Road, Great Cornard then in 1939 to 12 Farford Field where their son was born. Before the war Len was employed as a bricklayer and was a member of the Territorial Army. He was a well-known footballer for Sudbury Town. His daughter remembers him as ‘a loving hard working Dad, a family man, who spoilt her’. Len used to take his daughter rabbiting; her mother would then skin them and sell the skins to the tinker man for ½d. Before joining up Len served in the Home Guard and the family had evacuees – a mother and daughter - stay for 2 years with them. Len lies buried in Phaleron War Cemetery, Greece. The cemetery was originally created for the Commonwealth casualties of the Greek Civil War (December 1944 - February 1945) of which Len’s battalion were involved. It is situated on the coast road between Athens and Vouliaghmen. Len’s brother Jim Johnson lost his life serving in North Africa in May 1943; he is remembered on the Sudbury War Memorial and on the Roll of Honour in the Sudbury Heritage Museum located in The Town Hall.